Tan Dun: Eight Colors - "Drum and Gong", "Cloudiness", "Red Sona"
"In all of the selections on this disc," writes violist Phillip Ying, "there is a conscious blending of sounds, techniques, and ideas from traditional Chinese music with the string quartet of the Western classical tradition." Even casual listeners cannot miss the fact that they are not hearing the same old same-old here. In Zhou Long's Song of the Ch'in, for example, the composer asks the string quartet to imitate the sound of the ch'in, a zither-like instrument dating back to the first millennium A.D. The ch'in reappears in Vivian Fung's Pizzicato for String Quartet, which also conjures up the sounds of the Chinese pipa and the Indonesian gamelan. Traditional Mongolian music (including throat-singing) is evoked by Lei Liang's Gobi Gloria. Not only are instruments imitated or evoked, but also the scales, melodic contours, harmonies, and structures of traditional Asian music. Some of these selections actually are excerpts from larger works. The three selections by Tan Dan come from Eight Colors for String Quartet, and the two by Chou Wen-Chung are movements from a quartet called Clouds. It seems to me that there would have been more value in recording the entire works, but then this CD would have been less dim sum and more a Chinese main course, I suppose! This CD is not a collection of musical postcards, nor is it something that can fade into the background while one is doing household chores … or eating dim sum! In fact, this is pretty challenging music – more challenging than is the norm for the major labels these days, so thanks to Telarc for taking a chance on this project. The best way to hear it is like the best way to eat dim sum: one selection at a time, to let the distinctive "flavor" of each "dish" come through. The members of the Ying Quartet (Timothy and Janet Ying, violins; Phillip Ying, viola; David Ying, cello) are Chinese-American siblings with a penchant for innovative programming. 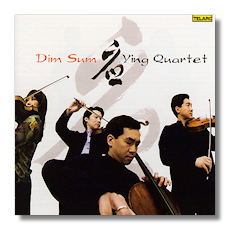 On a recent CD on another label ("United States," Quartz QTZ2055), the Yings play music by Ned Rorem, August Read Thomas, Chen Yi (again), and Jennifer Higdon, and that disc's predecessor contained other contemporary works, mostly commissioned by the Quartet. Fine musicians and fine musical citizens too, the Ying Quartet has made unusually relevant additions to the string quartet discography with releases such as these.